Cabbage sow in early spring or in late summer. If it is grown not for seed, the temperature should be low (about +16-20°C) and daylight is short, not more than 12 hours. If you sow cabbage seeds in spring, by early summer you can harvest. In the second decade of April conduct the sowing of seeds in separate pots, preferably with a loose formula. In one hole put 3 seed, seedlings appear after 3-4 days. When the seedlings grow 2-3 true leaves, in a pot leaving only one strong sprout, pluck the rest. Plants can be transplanted into the ground after about 20-25 days, when there are 5-6 true leaves. This should be done very carefully, since Chinese cabbage seedlings are very delicate and fragile. In the soil making one tea spoon of potassium chloride and ammonium nitrate at 1 m, and a tablespoon of superphosphate. If the land is barren, you can add a bucket of compost or humus. The best is the scheme of planting of cabbage 35x25 cm After planting each plant should be watered at the root. At first cabbage should be protected from frost. So she started heading out, it is possible to artificially shortened daylight hours, sheltering the landing layer have lutrasil. Caring for Chinese cabbage includes hoeing, regular moderate watering, weeding and fertilizing. The land should remain loose and moderately moist. During a drought to do abundant watering, spilling the soil to a depth of about 20 cm during the vegetation period aisle loosened 3-4 times. So after a heavy rain at the surface formed a crust, tillage should be deep — up to 12 cm. When sprouts appear, should be left in each well for one most sturdy and strong sprout, the rest have to remove. After three weeks after sowing plants Spud. Before I close the leaves, the soil should be shallow to aerate and add nitrogen fertilizer. When the ranks of the Chinese cabbage together, they need to dig. Harvest leaf varieties are harvested when formed 10-12 leaves. 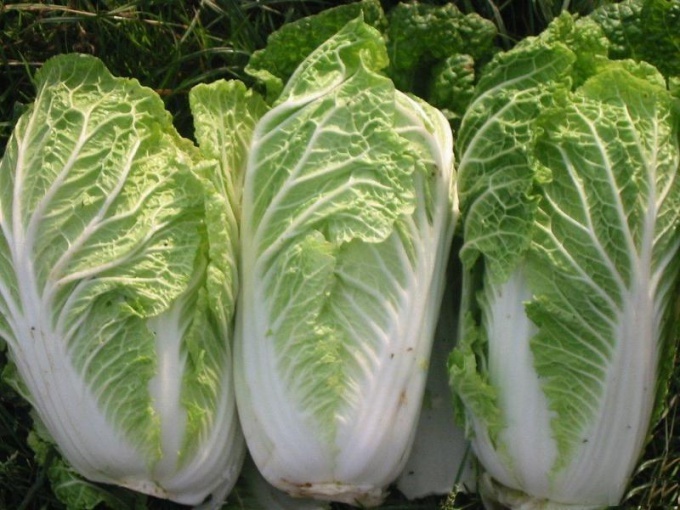 Chinese cabbage grows very quickly, usually in 20-25 days after germination and is ready to be eaten. A plant pulled out of the pillars, but you can cut the newly growing leaves, they pinch off from the outside.